Lynn Camp gets its name from a logging camp of the Little River Lumber Company in the 1920s. The old railroad trace provides a wide, flat path that is popular for horseback riding. I love to walk along the old railroad grade beside the Lynn Camp Prong in the Great Smoky Mountains National Park. It’s especially attractive in autumn, but any season is worth the trip. From Gatlinburg, take the Little River Road towards Cades Cove. Just past the Townsend Y, turn left into the Tremont area. Keep going straight, the road will turn to gravel and end with a parking area for the trail. Cross over the footbridge and take the trail to the left. 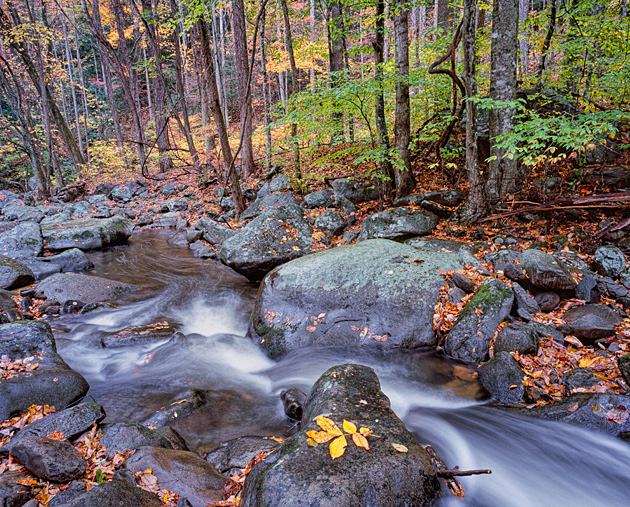 Several of my favorite images were taken along the Lynn Camp, including Smoky Mountain Monet and Smoky Mountain Magic.